Mrs. Robert Brydon Clematis: ground cover clematis. 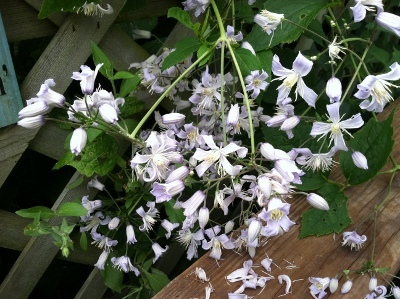 Looking for a clematis to use as a ground cover? Mrs Robert Brydon is a very vigouous lady so give her plenty of room. asked if we're sure she isn't kudzu in disguise! Mrs. Robert blooms in late August, giving late summer color.